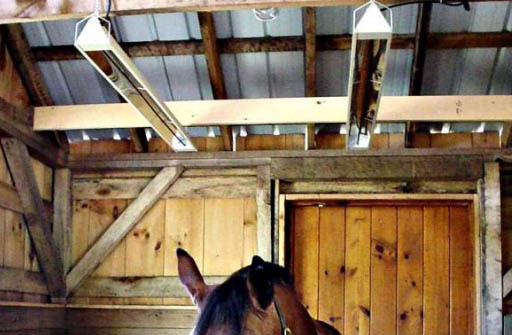 The Kalglo controlled electric infrared heating system provides spot or local comfort heat without affecting the temperature of the entire barn area. Infrared or radiant energy produces heating that is similar to the sun but without the visible light and UV. It heats only when the invisible rays strike upon a solid object or flesh, making it more cost-efficient. Our heaters don’t produce UV, so they will not cause sunburns. For questions about our radiant heaters, call or contact us today. The Kalglo electronically controlled heat system is unique because the radiant output of the heaters is controlled via infrared sensing and automatic feedback. An infrared sensor is placed under a representative heater and close to the subject. The sensor “feels” the temperature, air movement, the mean radiant temperature (MRT) of the surroundings, in addition to the infrared output of the overhead heaters that the subject feels. 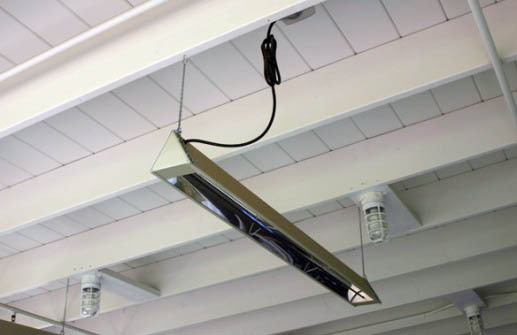 Kalglo stall heaters are 6 inches wide and 65-inches long and are available in 240 or 120 volts. The heaters are all aluminum with a baked enamel finish and they have durable metal sheath heating elements. Each heater comes complete with a 7-foot cord and plug, hardware, and enough hanging chain to hang the heater 6 1/2 feet down from the ceiling. 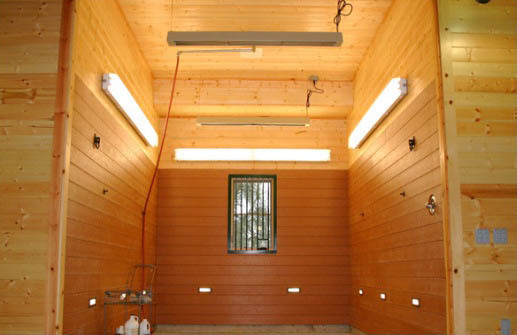 In a typical horse or wash stall, only one heater is needed and it is usually suspended about 8 feet above the floor. Our most popular model is: Model HS-2420 240 volt, 2000 watts, 8.3 amps. This is a very efficient heating system. It is far superior to a slower acting thermostat that only senses air temperature and provides either on or off switches for full radiant heat or no radiant heat. On-off switches or thermostats are fine for large, adult animals which only need heat on very cold days. But radiant heaters are best for continuous, life-process heating of small, newborn animals. On-off switches or thermostats can cause stress on these young animals. General: Kalglo radiant heaters are most efficient when facing down (not angled to one side) in draft-free environments. 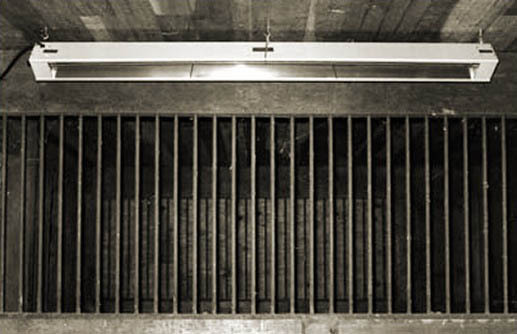 Wash Stall: The ideal position for the radiant heater should be lengthwise with the horse, with one end of the heater located above the horse’s withers. Horse/Foaling Stall: Usually it is best to hang the heater about 4 feet from one side of the stall, not directly in the center, to allow some room for the horse to move away from the radiant heat pattern. Tack Room: Hang the heater about 7 feet above the floor and position the heater so it radiates heat on the tack to help control mold and mildew. Keep your horses warm and comfortable with radiant heaters. These are great for newborn foals! Heat the horses, not the air in the whole barn! Dries horses faster in wash stalls, and splashing will not damage heating element. Warms show horses during the quick shedding of winter coats using an independent light source. Provides a large radiant heat pattern without visible light. Saves wear and tear on costly horse blankets. Durable metal sheath heating element lasts for years, even better than glass heat lamps!